As part of the Edinburgh Chinese Social Media campaign, sourcing and hosting KOLs (‘Key Opinion Leaders’) is one of the key strategies. There are different kinds of KOLs, including celebrities, bloggers and vloggers etc and they often specialise in different sectors, such as fashion or food and drink. As “trusted voices” they are a huge influence on their followers’ travel and purchasing decisions and therefore a great way for destinations to reach a wide and “warm” audience in a collaborative and cost-effective approach. WANG Xiaoguang, known as @cbvivi on Weibo, has over 1m followers and is one of the most influential vloggers in China. Xiaoguang’s follower profile is well educated young people, mainly living in the major “Tier One” such as Shanghai and Beijing, with slightly more female than male followers, which reflects the demographic of Chinese FIT travellers and is a great match for Edinburgh’s target Chinese visitor market. We invited Xiaoguang and his wife to Edinburgh to celebrate Hogmanay and shared the unique experience through his vlogs. Xiaoguang’s coverage commenced from his flight journey with Turkish Airlines, ‘It’s 28th Dec today, I’m flying to Edinburgh via Istanbul to join a very special new year celebration’, Xiaoguang said in his vlog. Following this he showcased Edinburgh’s three day Hogmanay celebrations in a further 3 vlogs, highlighting the moment when a group of people holding hands singing Auld Lang Syne together after the midnight fireworks. One of his followers commented ‘seeing this scene of Auld Lang Syne almost made me cry’. Xiaoguang himself said ‘I was expecting the midnight fireworks to be the biggest highlight but the whole Hogmanay experience is far beyond my expectations’. Through a partnership with VisitScotland, the visit also included a trip outside Edinburgh to visit Perthshire, V&A Dundee as well as the Glenturret Distillery & the Highland Chocolatier in the beginning of 2019, showcasing the wider appeal of Scotland as a “must see” destination for Chinese travellers. To date, his 4 vlogs have reached over 1.2m views and his followers have actively engaged over 11,000 times! 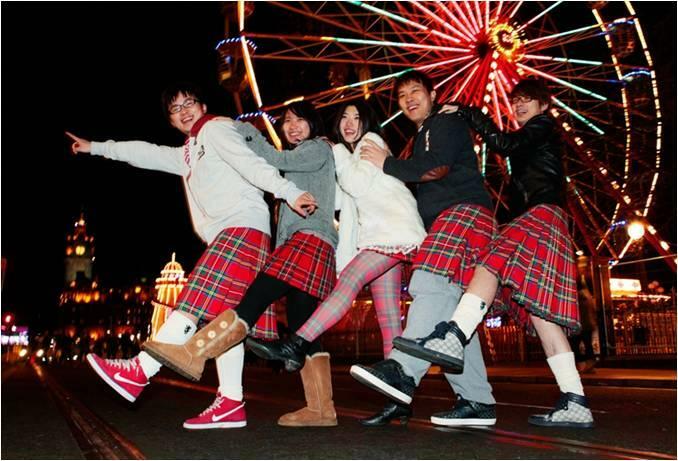 Xiaoguang’s unforgettable ‘Edinburgh Experience’ is a great example of partnership and collaborative working, which is at the heart of ETAG’s extremely successful Chinese Social Media campaign. The project is made possible through Scottish Enterprise’s Destination Edinburgh project and the VisitScotland Growth Fund direct financial support. However what really created the truly unique, memorable Hogmanay experience was the fantastic in-kind support provided by our Social Media business partners, Turkish Airlines, Edinburgh Castle, the National Museum of Scotland, Contini, Edinburgh Zoo, the Camera Obscura, the Balmoral Hotel, the Scotch Whisky Experience and the Scotch Malt Whisky Society. For this campaign, we were also supported by the Knights Residence, Festivals Edinburgh, Underbelly, The Collective and The Lookout – so a total of 13 businesses worked collaboratively to deliver this project alone!